In an age where the internet and social media are accessible by just about anyone with a computer or a smartphone, finding people with similar interests is merely a click away. Yet arguably, perhaps it is because of this heightened convenience that deep and real connections between people can sometimes be harder to establish. 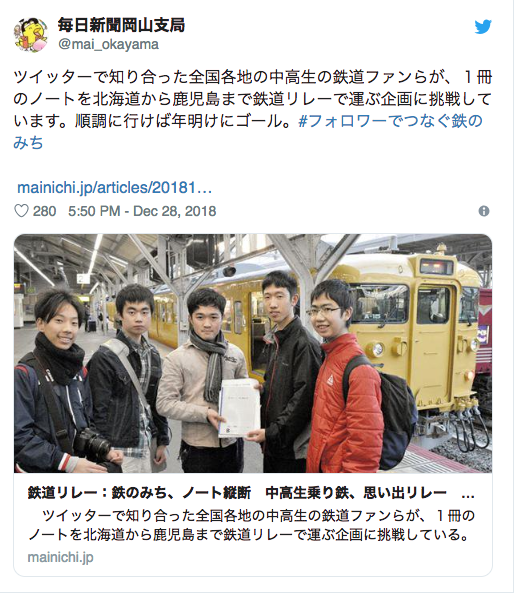 In an effort to connect Japanese train enthusiasts in a meaningful way, Twitter user @noruzo_tetsudo came up with an idea to relay a notebook by railway from the northernmost prefecture of Hokkaido to the southwestern region of Kagoshima. The notebook would be hand carried by Twitter followers who participated in the event (called “connecting railroads through followers”), and passed from person to person like a train version of the Olympic torch. @noruzo_tetsudo’s idea was met with an overwhelming response. ▼ The little book left the northern city of Sapporo in the arms of the first member on Dec 9 last year. A schedule was drawn up to ensure smooth transition to the next region. Members would meet up inside train stations and hand over the notebook in a gesture perhaps considered primitive by today’s standards. ▼ Yet it brought everyone together with a single purpose that was significantly more meaningful than tapping away at smartphones. Although a miscalculation caused two members to miss a scheduled meet-up, a quick express train ride was all it took to rectify the situation. 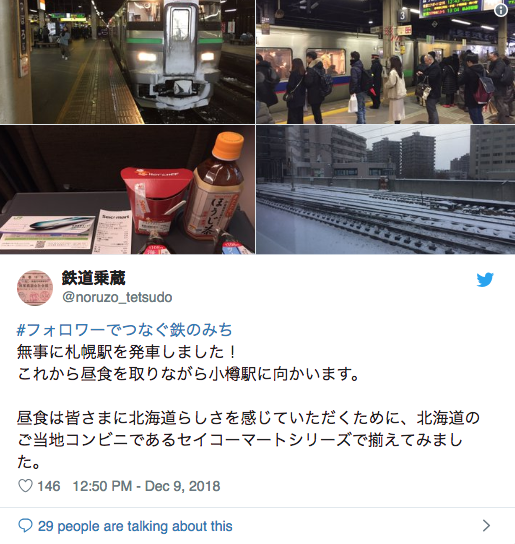 Finally on Jan 5 at 9:45 p.m., almost one month since the event started, the notebook ended its 376.6-kilometer journey in Kagoshima Chuo Station. What started off as an ordinary notebook turned into a railway enthusiast’s treasure filled with details like the train models it was carried on, as well as heartfelt messages from the relay members. A final message at the end reads: “Railroads will never end”. True, the same journey could have been performed much faster and with less hassle with just a few shinkansen rides, but that would have excluded a huge number of train fans eager to be part of something grand and magnificent. Thanks to everyone’s concerted effort, the event has connected fans in a truly unique way, something that technology can never replace. This is a very sweet story and photo of the young men. Love for railroads runs deep here in Japan.